We held the exhibition "Fluxus of the George Maciunas by the George Maciunas for the George Maciunas". It focused on George Maciunas, the "leader" of Fluxus and investigate his thinking and dreams about Fluxus. On this occasion, we have a plan to make a translation of "Flux Fest Sale" and "Flux Fest Kit 2" (1967) in bilingual (English, Japanese). In 1966, George Maciunas published “FLUXFEST SALE” which was a compilation of the Fluxus event instructions. Those instructions could be realized by anyone and also anyone could organize Fluxus event, therefore it was an epock-making experiment by the open source methods. 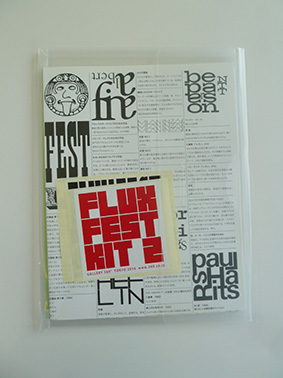 The second issue, titled “FLUX FEST KIT 2”, was published in ca.,1970. The print was a collection of the instructions mainly for the outdoor big festivals, for example Fluxus-Olympiad and Fluxus-Parade. And it indicates Maciunas's intention that aimed to expand events originally started in the small indoor space to the surrounding environment with addition of some entertainment effects. On this occasion, we Gallery 360° has just published this “FLUX FEST KIT 2” of Japanese edition. The envelope contains the following items. 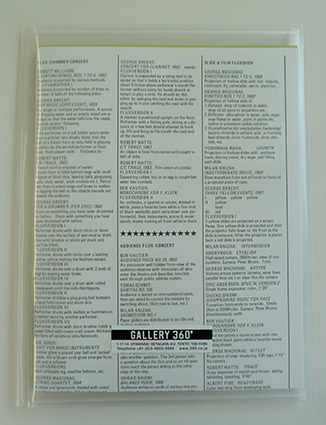 The article “FLUX-PRODUCTS 1961 TO 1970” was printed in two columns on the back page of the English edition. This Japanese edition introduces the original instructions by Mieko Shiomi and “FLUX WEEK” (in Tokyo, 1965) related to "FLUX FEST KIT 2" instead of “FLUX-PRODUCTS”. 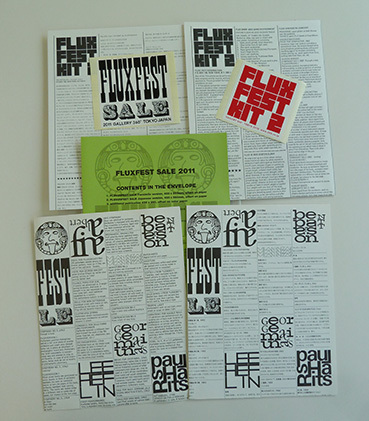 This is a set of two printed matters "FLUXFEST SALE" and "FLUX FEST KIT 2". With these two printed matters, the instructions collected by George Maciunas is covered.